The Castle SONIK, a high performing and easy to use sound level meter. SONIK-S is designed for the health and safety manager who has the responsibility of protecting their workforce from excessive noise exposure. SONIK-S has built in pre-set measurement templates, allowing you quick and simple set up using the straightforward Menu navigation. Quite simply, the SONIK-S is a productive tool that every safety manager should have. If you also need to carry out Environmental Noise surveys, choosing the SONIK-SE will provide you with a host of environmental parameters that are required for applications such as BS4142 (complaints about industry), BS5228 (construction noise), Planning Guidance, Boundary Monitoring and many more. Ensure you're measuring the correct data by simply choosing one of the pre-set measurement templates, allowing you to easily switch between measuring for Occupational and Environmental noise applications. 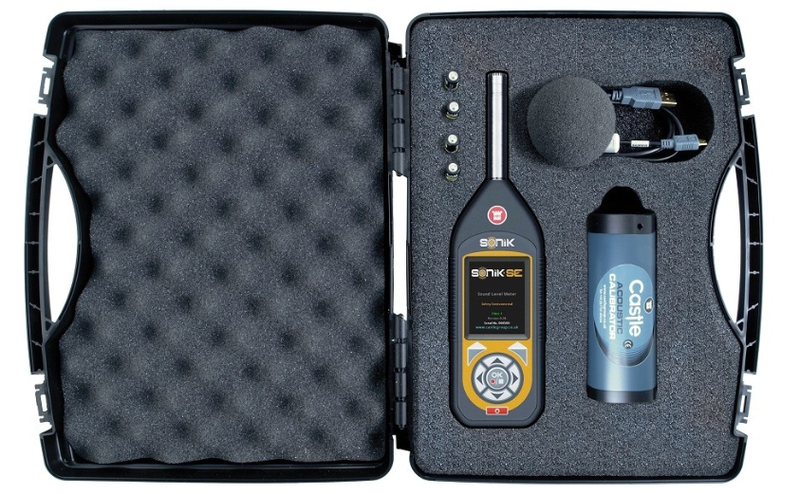 With it's simple measurement set up and intuitive interface, the SONIK-S makes conducting occupational noise surveys simple and straightforward.This system includes a Class 1 Sound Meter with protective rubber casing, Class 1 Acoustic Calibrator, PC Noise Analysis Software, Cloud Based Noise Analysis Software and a Protective Carry Case. If you're responsible for the safety and protection of employee's, this system provides you with everything you need to protect your workforce from over exposure to noise, as well as helping you ensure your company complies with The Control of Noise at Work Regulations 2005. This system also boasts a host of environmental parameters that are required for applications such as BS4142 (complaints about industry), BS5228 (construction noise), Planning Guidance and Boundary Monitoring.